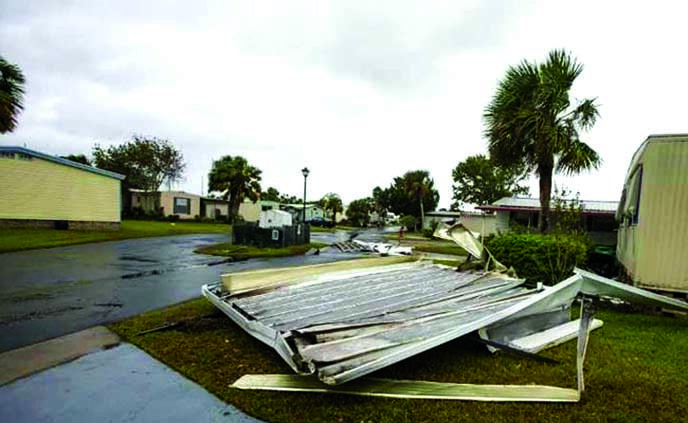 Hurricane Michael killed at least 30 people in four states, as the storm made its way through the southeastern United States last week, new local estimates showed Tuesday. Twelve bodies were recovered in Bay County, Florida, Sheriff Tommy Ford told local media, bringing the death toll up to 20 in that state. The powerful Category 4 storm, which originally made landfall along Florida's Gulf of Mexico coastline with winds of up to 155 miles (250 kilometers) an hour, also left one person dead in Georgia, three in North Carolina and six in Virginia. Hurricane Michael left scenes of destruction in its wake in Florida, and authorities fear the death toll could still increase as the search operation continues in the most heavily damaged areas. Nearly 137,000 Florida homes and businesses were still without power Tuesday, and several water and food distribution points were still in place for affected residents throughout the state. Some jurisdictions implemented curfews and most schools in the affected areas were closed until further notice. Rescue teams searched ravaged areas of Florida's Panhandle on Tuesday for hundreds of people reported missing nearly a week after Hurricane Michael flattened communities in the region and killed at least 30. Reuters, Taipei :Taiwan has not been intimidated by China's military drills this week, President Tsai Ing-wen said on Tuesday, after the latest Chinese maneuvers were denounced by a senior U.S.